Instructions: My card size is 4 1/4 x 5 1/2". 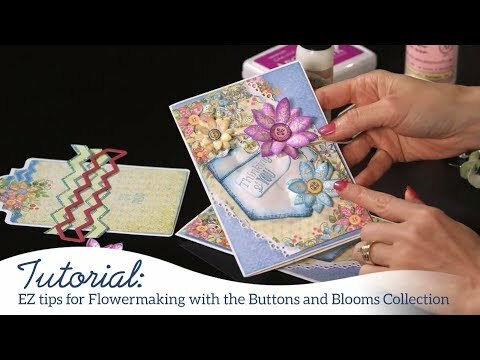 Make card base and cover with one of the card fronts from the paper collection. Find one of the sentiments on the paper collection and cut out and glue to the card front. 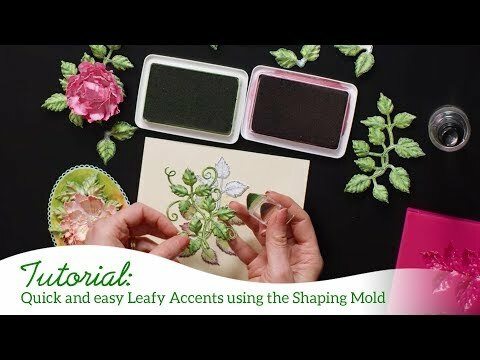 Using Olive Green ink stamp the leaves onto white cardstock and color using Bamboo Leaves Memento Ink. Cut out with coordinating die. Place the leaves onto the mold and run through the Vagabond then set them aside to dry. Using blue and fuchsia ink stamp the flower petals onto white cardstock and then cut out using the coordinating die. Use the Deluxe Flower Shaping kit to shape the flowers and add Prills to the centers. Set aside to dry. Once everything is dry decide on the placement on the card front and glue down. The quick and easy card is ready to go!